Man's best friend can do a lot more than fetch and roll over. Research now suggests that dogs can actually help children learn to read. For young kids, one of the big challenges in learning to read is the embarrassment of making mistakes. Reading to dogs provides a simple solution -- a non-judgmental, comforting furry friend who "listens" and takes the pressure off a child as he stumbles. "Kids have to practice, practice, practice to be good readers," said Francine Alexander, the chief academic officer at Scholastic, the children's book publisher. "And yet when you're practicing, if you make a mistake, it can feel risky and uncomfortable. But if you're practicing with a dog, you don't mind making the mistake." A study this year by researchers at the University of California, Davis confirmed that children who read to Fido really do perform better. Young students who read out loud to dogs improved their reading skills by 12 percent over the course of a 10-week program, while children in the same program who didn't read to dogs showed no improvement. The positive effects of the concept are seen firsthand at the East Norwalk Library in East Norwalk, Conn. where students read to dogs as part of the "D2R2" program. The specially-trained therapy dogs are accompanied by their handlers, and the kids clearly love it. "I have somebody that listens when I read," said Linda, one of the young participants. "If I make a mistake, there's no one around me to laugh." When ABC News first visited in March, eight-year-old Kevontae Haye had just met Brasil, a three-and-a-half year-old whippet. Kevontae picked a children's book -- fittingly about a boy and his dog -- and began to read to his new friend. The first day, Kevontae was clearly struggling, reading words in a halting voice. But when ABC visited again six weeks later, the improvement was remarkable. His fluency had improved dramatically, and the second-grader was able to make it through passages he had found difficult before. "He was struggling. He's not struggling now," said Brasil's owner and handler, Don Smith. Kevontae had noticed his improvement, too, and he had a ready explanation. "[It's] because I'm relaxing while reading to Brasil," he said. "It's just you and the dog." Kevonte has shown improvement on his most recent reading skills test, and his parents see another difference -- he now wants to read at home. 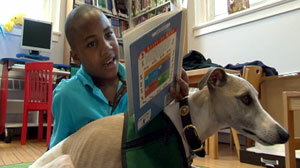 One boy now has a brighter future, thanks to a furry friend who was willing to listen. ABC's Bradley Blackburn contributed to this report.